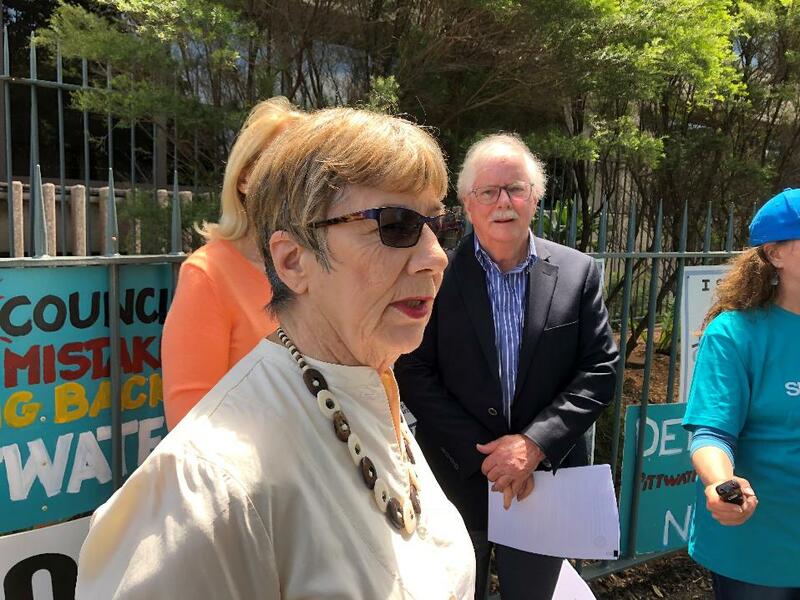 Protect Pittwater spokeswoman and former Pittwater Mayor Lynne Czinner at front with Save Our Councils spokesman Phil Jenkyn to her right. All political parties except the Coalition have backed Pittwater campaigners’ call for an immediate response by the NSW government to their council demerger proposal - after a five-month delay. The call made at a media conference outside NSW Parliament House on Thursday followed comments earlier in the week by NSW Local Government Minister Gabrielle Upton that communities wishing to demerge should follow the official process. Protect Pittwater Association president Bob Grace said the group had submitted a proposal to NSW Local Government Minister Gabrielle Upton in May calling for the demerger of Pittwater from the Northern Beaches Council. The proposal followed the provisions of the Local Government Act and was accompanied by nearly 3,500 signatures – 10 times the number required under the act, Mr Grace said. Since then, Protect Pittwater had telephoned the minister’s office numerous times and three weeks ago had written to her asking for an urgent response – to no avail. At a media conference on Thursday, former Pittwater Mayor Lynn Czinner said Protect Pittwater members had seen reports of the minister at a local government conference in Albury saying there was a process to demerge. “We’re going through that process but that process isn’t getting us anywhere,” Ms Czinner said. “We are no further advanced than we were five months ago when we put the petition in so we are quite frustrated and angry. Local Government NSW – the association of councils from around the state – this week passed a motion agreeing to support “communities that seek to demerge from a forceably amalgamated council” with overwhelming support at its AGM in Albury. The motion also promised LG NSW would lobby for a change to the Local Government Act to prevent the forced amalgamation of councils or significant boundary alterations without the support of a plebiscite. Save Our Councils Coalition spokesman Phil Jenkyn said the motion was significant because it was passed by the vast majority of the 800 delegates to the conference. “The people in that room were all voted in twice – once by their community and once by their council and they expressed a strong view,” Mr Jenkyn said. Communities such as Pittwater and Tumbarumba – which was also following the government’s demerger process and waiting for responses - were angry and frustrated by the government’s inaction. Many others would come out after the state election next March, “after this government is thrown out of office, they are going to be asking, demanding, of the Labor Party and the other parties to fulfil their promises”, Mr Jenkyn said. Meanwhile, NSW Labor Opposition Local Government spokesman Peter Primrose assured the community that if his party formed government after the state election, it would ensure legislation was introduced allowing local communities to decide if they wished to demerge. Labor would talk with local communities in developing that legislation and look at other places such as Queensland where it already existed, Mr Primrose said. It would also consult with unions such as the United Services Union – representing administrative and clerical workers - to make sure that their members were not disadvantaged. “But the bottom line is we will make sure that we allow communities who wish to demerge an easy process which will allow them to actually demerge,” he said at Parliament House. “Macquarie Street should not run local councils, there should be no forced mergers, there should be no forced demergers. NSW Greens Local Government spokesman David Shoebridge said it was shameful that the Local Government Minister had not responded to the call from more than 3,000 Pittwater residents urging the Boundaries Commission to initiate the demerger process. The Greens supported the proposal and residents’ right to have a say on the final shape and future of their local council – along with all parties except the Liberals and Nationals, Mr Shoebridge said. “What they’re saying to the local government minister is at least respond to the petition,” he said at the media event. Also at Parliament House, Shooters, Fishers and Farmers Party MLC Robert Borsak said that if his party gained the balance of power in Parliament next year, it would make sure every council area had an opportunity to decide whether it wanted to demerge. “And I’m sure I know what the answer is,” Mr Borsak said. “Pittwater and I know Tumbarumba, for example, are very hot to go back and become independent again. “And we’ll make sure it happens. We’ll make sure the funding’s there to have a referendum. Protect Pittwater also wrote to NSW Premier Gladys Berejiklian in May asking her to act on a motion passed at a community forum earlier that month, demanding an immediate and binding referendum of the former Pittwater Local Government Area on its demerger. However, Mr Grace said that apart from an acknowledgement of receipt, the Premier has not responded to this letter either. In a major rebuff to the Berejiklian State Government’s 2016 policy of forced council mergers, the annual conference of Local Government NSW has today thrown its support behind local communities forced to merge who want their councils back. In what will be seen as a pre-March 2019 State elections issue other communities that have been fighting for demergers will take heart from this support and renew their attempts to demerge from their forced bigger councils. With attendance at the Conference by leading members of Save Our Councils Coalition (SOCC) and a large number of demerger activists from Tumbarumba and Gundagai who were invited into the auditorium, the resolution was overwhelmingly passed by delegates who recognised this as an issue burning at the heart of many local communities. “What this shows is that local communities that were forcibly merged throughout NSW recognise their strength in the lead up to the March 2019 State election. This conference resolution together with huge by-election swings against the Government in NSW seats where council mergers were widely condemned, shows local communities that demergers will be a critical issue in the 2019 election,” says SOCC President Brian Halstead. “We congratulate Local Government NSW and its delegates for their support on this issue, and the extraordinary level of political activism by the communities of Tumbarumba, Gundagai, Pittwater, Guyra and many others that continue to fight for their independence,” Halstead said. 2. Lobbies for a change to the Local Government Act to prevent the forced amalgamation of councils or significant boundary alteration without the support of a plebiscite. Community members who attended from Tumbarumba and Gundagai, also members of Save Our Councils Coalition, congratulated delegates for supporting communities across NSW who have had their councils forcibly merged and want to Demerge Now. 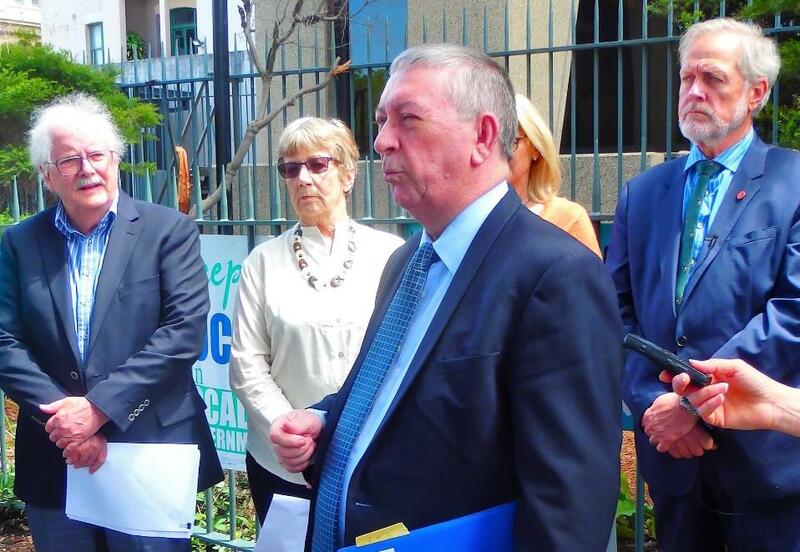 L to R: Phil Jenkyn Save Our Councils Coalition representing communities across NSW, Lynne Czinner 'Protect Pittwater', Peter Primrose Labor Shadow Minister for Local Government addressing the media conference and Robert Borsak SF&F Party.